The main difference between Access Smile and other companies offering dental treatment overseas is that we are not brokers. 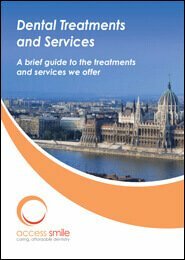 Our clinics in Budapest are owned and managed by Access Smile, meaning that we will provide you with the highest quality of aftercare and any help required in the unlikely event that something should go wrong, at no extra cost – guaranteed. Making the decision to have dental treatment abroad is a huge choice to consider, and we understand that you will have questions and concerns. We will always be happy to answer these, and will be on-call after your treatment should you have any queries or concerns. The level of aftercare support offered by the Access Smile Team in Ireland and Hungary is unsurpassed and beyond that of any other dental practice we know of in any of these countries. We use the highest-quality materials and techniques, hence the lifetime of your treatment may well be greater than that of the same treatment at other dental practices, provided you look after your teeth well. We are the only dental practice with a guarantee that includes root canal treatment. Rarely (in less than one in 1,000 cases) teeth suffer preparation trauma during crown and bridgework treatment, needing root canal treatment afterwards. Most dental clinics do not accept liability for this and would charge you extra, but with Access Smile any root canal treatment needed will be carried out free of charge for a period of up to six weeks after your complete your initial treatment. Our guarantee includes all work required to treat any reaction – you won't pay a penny more, not flights, not accommodation – nothing! Enter the characters shown in the Verify field. Copyright © Access Smile. All rights reserved.